Peering into the heart of the Milky Way galaxy, NASA’s Nuclear Spectroscopic Telescope Array (NuSTAR) has spotted a mysterious glow of high-energy X-rays that, according to scientists, could be the “howls” of dead stars as they feed on stellar companions. Groundbreaking images of the Sun captured by scientists at NJIT’s Big Bear Solar Observatory (BBSO) give a first-ever detailed view of the interior structure of umbrae – the dark patches in the center of sunspots – revealing dynamic magnetic fields responsible for the plumes of plasma that emerge as bright dots interrupting their darkness. Their research is being presented this week at the first Triennial Earth-Sun Summit meeting between the American Astronomical Society’s Solar Physics Division and the American Geophysical Union’s Space Physics and Aeronomy section in Indianapolis, Ind. The high-resolution images, taken through the observatory’s New Solar Telescope (NST), show the atmosphere above the umbrae to be finely structured, consisting of hot plasma intermixed with cool plasma jets as wide as 100 kilometers. “We would describe these plasma flows as oscillating cool jets piercing the hot atmosphere. Until now, we didn’t know they existed. 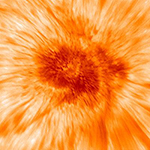 While we have known for a long time that sunspots oscillate – moderate resolution telescopes show us dark shadows, or penumbral waves, moving across the umbra toward the edge of a sunspot – we can now begin to understand the underlying dynamics,” said Vasyl Yurchyshyn, a research professor of physics at NJIT and the lead author of two recent journal articles based on the NST observations. Artist’s impression. Art by Karen Teramura & BJ Fulton, UH IfA. Astronomers have discovered a planetary system orbiting a star only 54 light-years away with the Automated Planet Finder (APF) at Lick Observatory and ground-based telescopes in Hawaii and Arizona. The team discovered the planets by detecting a wobble of the star HD 7924, a result of the gravitational pull of the planets orbiting around it. All three planets orbit the star at a distance closer than Mercury orbits the sun, completing their orbits in just 5, 15, and 24 days. The APF facility at Lick Observatory offers a way for astronomers to speed up the exoplanet search. The fully-robotic telescope searches for planets every clear night of the year, so planets and their orbits can be discovered and traced quickly. “The APF is great for two reasons. One, it has the superb Levy spectrometer. Two, it is a modern computer controlled telescope so we can automate it. This combination means that we can observe stars night and night out to look for the wobble,” said Bradford Holden, an Associate Research Astronomer for UC Observatories (UCO) who helped to make the telescope robotic. Astronomers using the National Science Foundation’s Very Large Array (VLA) have found a long-sought “missing link” between supernova explosions that generate gamma-ray bursts (GRBs) and those that don’t. The scientists found that a stellar explosion seen in 2012 has many characteristics expected of one that generates a powerful burst of gamma rays, yet no such burst occurred. “This is a striking result that provides a key insight about the mechanism underlying these explosions,” said Sayan Chakraborti, of the Harvard-Smithsonian Center for Astrophysics (CfA). “This object fills in a gap between GRBs and other supernovae of this type, showing us that a wide range of activity is possible in such blasts,” he added. The object, called Supernova 2012ap (SN 2012ap) is what astronomers term a core-collapse supernova. This type of blast occurs when the nuclear fusion reactions at the core of a very massive star no longer can provide the energy needed to hold up the core against the weight of the outer parts of the star. The core then collapses catastrophically into a superdense neutron star or a black hole. The rest of the star’s material is blasted into space in a supernova explosion. After spending more than a month in orbit on the dark side of dwarf planet Ceres, NASA’s Dawn spacecraft has captured several views of the sunlit north pole of this intriguing world. These images were taken on April 10 from a distance of 21,000 miles (33,000 kilometers), and they represent the highest-resolution views of Ceres to date. Subsequent images of Ceres will show surface features at increasingly better resolution. 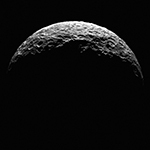 Dawn arrived at Ceres on March 6, marking the first time a spacecraft has orbited a dwarf planet. Previously, the spacecraft explored giant asteroid Vesta for 14 months from 2011 to 2012. Dawn has the distinction of being the only spacecraft to orbit two extraterrestrial targets.